Lets face it, as women we love receiving gifts. With all the duties that come with being a super bridesmaid it feels amazing to feel appreciated. I decided to give you a couple of gift ideas to give your favorite girls for helping you through the stress and craziness leading to your big day! 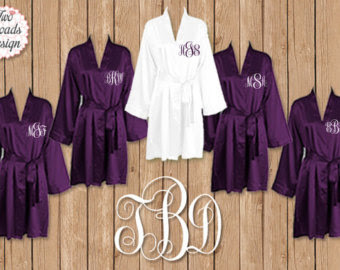 Satin Robe with a Personalized Monogram. I personally love being in a robe rather then full on attire. It is so comfy. This would be an amazing gift to offer. When you have your gathering the night before it would be SO CUTE to take selfies all dressed in robe attire with your facial masks and most favorite girls around you. Wrist-lets. This gives room for personality. Give each bride a cute wrist-let wallet in their favorite color to always have with them. There is nothing more annoying then a huge purse strapped to your shoulder when you are on the go. Especially when wedding planning. Desk Accessories. If your bridesmaids are office busy then a basket of cute office supplies should suffice. I personally love to show my personality at my desk, AND if you chose these women to be your bridesmaids then you must know a lot about them. This way your gift will be used everyday. Monogramed Mug. I LOVE COFFEE IN THE MORNING. I think this is one of the cutest gifts there is. I have a favorite mug and your bridesmaids should have one to. Something they all share in common. It would be used for a life time. Eye shadow Pallet. Another amazing gift. Every girl loves to feel girly. Gifting them with makeup is a perfect way to add onto that feeling. Spa Candle. Candles bring tranquility. It is a cute gesture and thank you. Best-Friend Necklace. Perfect gift to say thank you. 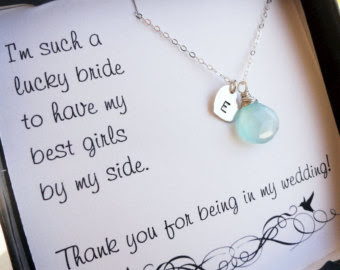 Give your bridesmaids a necklace that has a little quote that shows them how grateful you are for their presence and guidance throughout the process. Spa Gift. What better way to say thank you then a spa day?? They are going through as much stress as you are because they love you, a great gift is a day at the spa. Plus you can enjoy it with them. That is always a plus. Jewelry. What girl doesn't love jewelry. Buy your bridesmaids matching earrings to wear for the big day. Totes. Totes are lifesavers for beach days or days on the town. No matter what the occasion a tote can do a girl good. Plus you can probably customize them to your liking?? The ideas are infinite. Yes I know you are spending loads of money on your wedding, but do not forget about your bridesmaids most likely busting their butts to make your big day spectacular. A simple thank you gift can really get the girls feeling good about all the work and effort they put into your day.